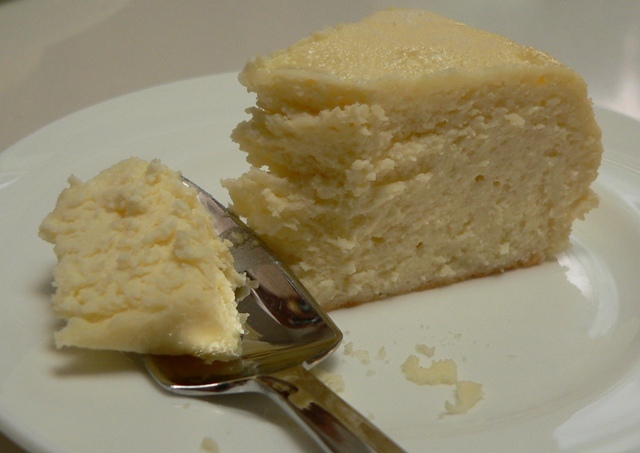 Still experimenting, I made a crustless ricotta cake for Pete A, who can always use another gluten free dessert. As I’m unable to ever change just a single parameter (very unscientific of me, I know), I also tried making this with normal (wet) ricotta, which had been drained in a sieve. It worked very well, so if you can’t find dry ricotta, you could probably substitute standard ricotta in its place – just make sure you drain it for at least an hour until it’s really dry. If you’re buying wet ricotta, make sure you buy more than you need, and measure the ricotta for the recipe after it has drained. 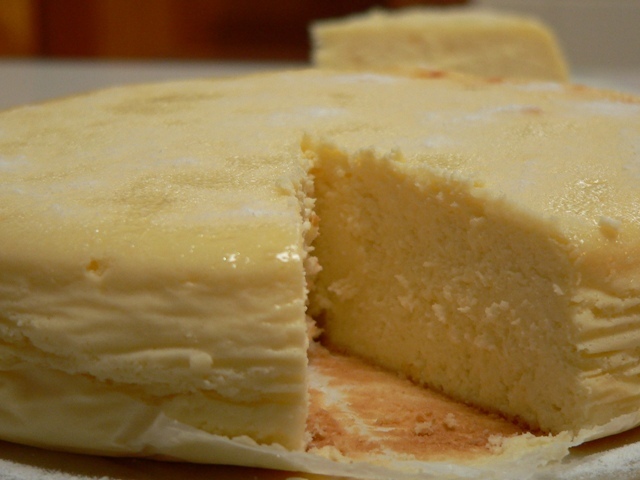 Of course, you could also use dry ricotta for this recipe, as per our original recipe. To make the crustless ricotta cake, I lined my 8″/20cm springform tin with a large sheet of foil, to prevent leaks. I then lined the inside of that with parchment paper. Make sure you choose gluten free cornflour, as some brands are made from wheat. Also, check the packaging of the icing sugar mixture carefully. The one I buy has “gluten-free” on the front of the bag. The gf varieties include maize or tapioca flour as an anti-caking agent, whereas the cheaper brands often use wheat starch. 2. Preheat the oven to 150C (with fan). 3. Carefully pour the prepared filling mixture into the cake tin and bake for 40 – 45 minutes until the mixture is set. Allow the cake to cool in the oven with the door ajar (for at least an hour, two is better), then put the whole tin in the fridge to cool until cold. Carefully unwrap the foil and remove the springform tin. 4. Let the cake rest overnight in the fridge, then dust liberally with icing sugar before serving. This was so easy to make without the pastry and, while it’s less pretty than the crusted version (Pete’s comment was that it looked like a wheel of cheese, which is what it is, I guess), it’s could probably be dressed up with a fancy topping of lemon curd or strawberries and cream. that looks lovely. Now that you have solved one of my problems (gluten), can you work on the other…dairy? :) Only kidding. 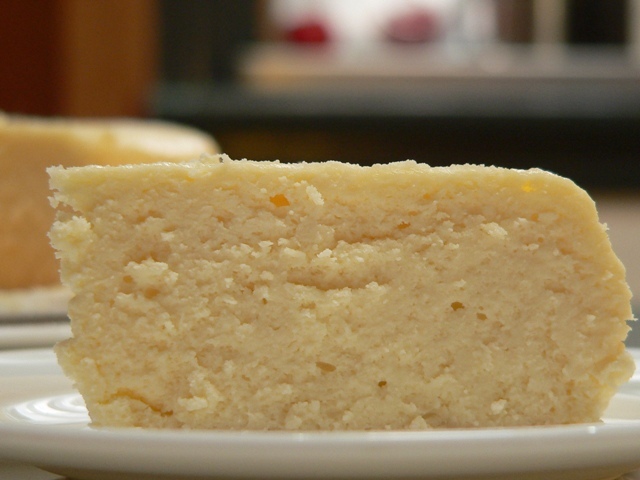 It would be worth the suffering to eat a slice of either of your two versions of ricotta cake. Thanks for trying out the standard ricotta option too – good to know as dry ricotta is not easily available where I live. I’m humbled by the complexity in the construction. The only difficult part of eating this is stopping – I get the easiest and most enjoyable job (gf guinea-pig)! Yum Yum Yum.